Scrapped abilities, concept art, eggs, and more. This week, it’s all about Neeko, the Curious Chameleon! Did Neeko have any crazy abilities during development that didn’t make the cut? At one point, she had a high-range trap nest (think 2000 range) for her ultimate which took a long time to arm but did a lot of damage. The idea was that you’d lay it in a place you thought the enemy would go, and disguise yourself into an ally to lead them there. It turned out to be ridiculously frustrating to play against because people didn’t feel like they could go anywhere since they did not have any clue to where she could have cast the traps. 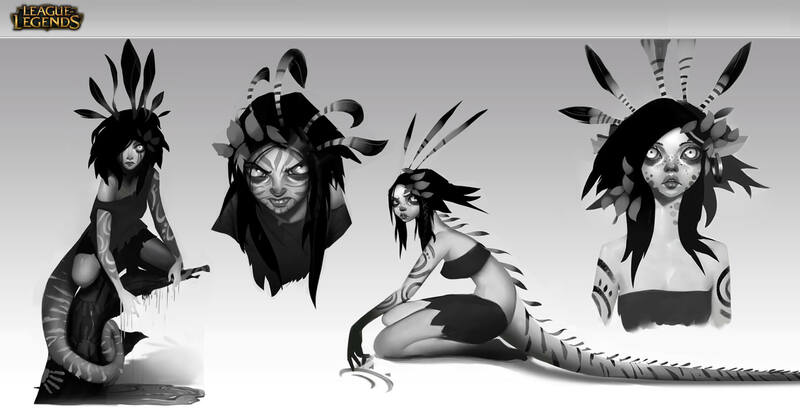 What did Neeko look like in early concept art? Since we hit the idea of “a chameleon vastayan” pretty early on, she looks pretty much like the initial concept. In the early explorations, she was wilder and less influenced by civilization. But actually, the way she’s evolved to look now is because she’s constantly learning from and mimicking other people, and that makes her less wild and more like a human being. 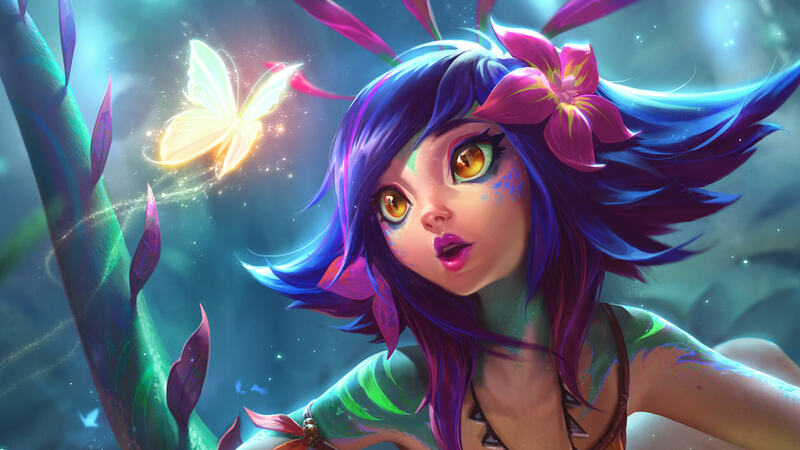 What were some of the inspirations for Neeko? Skekses: One of the early inspirations when I pitched the “chameleon vastaya” idea was Leeloo, one of the characters from the movie The Fifth Element. I love the way she learns, the way she moves, and how curious she is. FauxSchizzle: Personality wise, there was also Starfire, Mantis from Guardians of the Galaxy, Eleven from Stranger Things, X-23, Stitch… very quirky, fish-out-of-water characters who have tremendous untapped power potential. They’re often stronger than they know, but always good-hearted and open. Is Neeko a vastaya, with human blood? Or is she a Vastayashai’rei? Neeko is not a pure Vastayashai’rei, but she is closer to it than most of the other vastaya. The Oovi-Kat tribe splintered off from the vastaya tribes very early and have largely lived in isolation, so their magic is more pure and ancient than other vastaya. There is very, very little human blood in Neeko’s lineage. Someone like Xayah—who longs for a time before the vastaya were diminished by the pact made with humans—would freak out upon meeting Neeko. She’d probably feel a little envious because Neeko is so strong with spirit energy, but it’d also make her hopeful that the vastaya aren’t as diminished as she perceives. Neeko loves to try new things, but her current favorite is cheese breads, both the ones found in Valoran and a similar pastry made by her home tribe. I wonder who invented the cheese bread recipe first? How’d you get Neeko’s passive to work? Even though we had a mimic mechanic in Black Market Brawlers in the Trickster’s Glass item, it was created by combining a bunch of existing code rather than being a custom-built system. With Neeko, we needed to engineer something that could fully support the disguise mechanic. This was not only a rewrite of the disguise code, but also cleanup for existing systems like clone interactions with buffs and debuffs. There are some small bugs and edge cases with Neeko’s passive that we need to fix, but with the new code we can solve them systemically rather than build a million special casings. Why does Neeko have to be in the center of the fight to use her ultimate when she’s a mage? We kept her range relatively low because the disguise and clone gameplay was much more interactive when she had to take risks herself to be effective (this connects back to why we moved away from the “trap nest” ability as her ultimate). Having unusual win conditions like “jump into the frontline as a ranged champion” also gave the Neeko player more feedback on when they tricked the enemy. … does Neeko lay eggs?